Drunk by their success in the midterm elections, Republicans aim to block Obama´s important, but overly cautious, steps toward stopping five million more deportations. Intoxicated by winning the Senate, the GOP dreams again of blocking the limited health care access for millions that the Affordable Care Act started to provide. With willful ignorance about climate change, Republicans aim to force through the Keystone XL pipeline to serve big oil profits. They are playing with fire. They will overreach. They don´t understand the true nature of the midterms, which did not reflect a shift to the right in society. For example, ballot initiatives to increase the minimum wage passed in Alaska, Arkansas, Nebraska, and South Dakota – the latter two reliably “red” states. In San Francisco, voters passed a referendum for a $15 minimum wage by an overwhelming 77%. However, a demoralized electorate had no reason to turn out for Democrats. A historically low turnout of voters – the lowest since 1942! 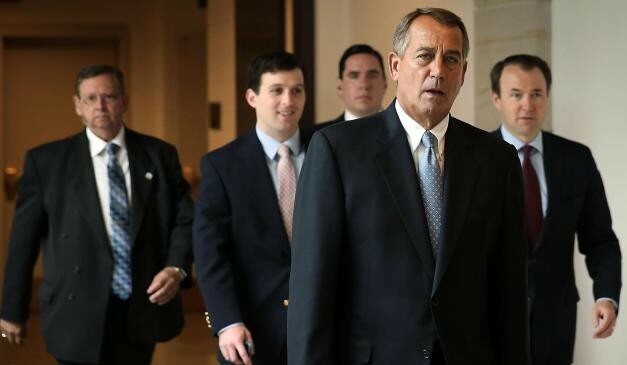 – revealed it again: most Americans are fed up with all representatives in Congress. “Too many Democrats are too close to Wall Street,” said Democratic Senator Sherrod Brown of Ohio. “Too many Democrats support trade agreements that outsource jobs, and too many Democrats are too willing to cut Social Security — and that’s why we lose elections” (NY Times, 11/15/2014). First, the election of an open socialist to the Seattle City Council last year shows that there is space for independent left candidates who refuse to serve big business and reject corporate cash. The impact of Howie Hawkins’ and Jess Spear’s campaigns this year reinforces this conclusion. Second, with the Republicans in power and no national elections for two years, people will look past elections to build struggles and movements in the streets. In 2010, the midterm success of Republicans and Tea Party candidates laid the basis for a huge response: the Occupy Movement. Every provocation of the Republicans – against immigrants, with Keystone XL, against LGBTQ people, or against workers´ rights – has the potential to spark new movements. Unfortunately, conservative labor and environmental leaders won’t prepare or build these struggles. But the seeds are there: look at Ferguson, the People’s Climate March, #CarryThatWeight, and service workers striking for living wages. Let´s get ready for the next round on the streets. On that basis, we can take on the Republican threat. Let’s build movements so we don’t have to rely on the timid, pro-business Democratic Party establishment. Democratic Socialists Win in Election that Upends Chicago Democratic Establishment–Build Movements for Working Class Gains! Socialist Alternative is a national organization fighting in our workplaces, communities, and campuses against the exploitation and injustices people face every day. We are community activists fighting against budget cuts in public services; we are activists campaigning for a $15 an hour minimum wage and fighting, democratic unions; we are people of all colors speaking out against racism and attacks on immigrants, students organizing against tuition hikes and war, women and men fighting sexism and homophobia.